Authorities cracked down on thousands of protesters flooding downtown Montreal after Molotov cocktails were thrown. 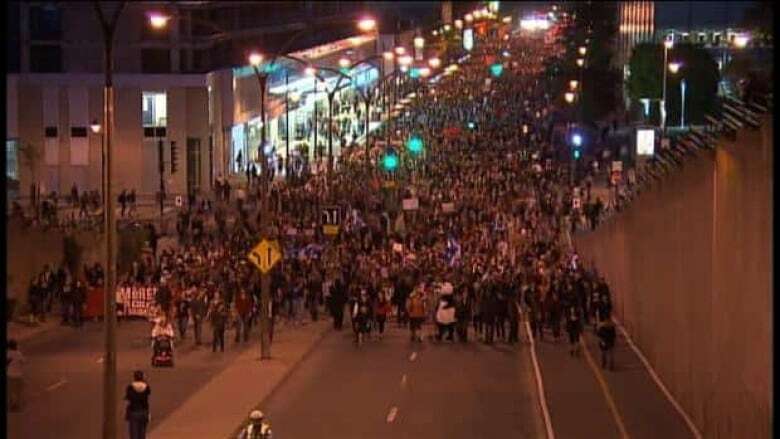 Authorities cracked down on thousands of protesters flooding downtown Montreal near the Berri-ÙQAM metro station after Molotov cocktails were thrown. Police declared the protest march illegal at 9:54 p.m. after several fire devices were thrown from the crowd, near St-Laurent and René-Levesque Boulevards. Riot police responded with tear gas and noise bombs, and ordered the thousands of people marching in a show of defiance against a legal crackdown on protests by the Quebec government to disperse. Officers in armour blocked St-Laurent Boulevard to contain the crowd. Some smaller groups splintered from the main march and made their way down side streets in Chinatown. But the march's tail swelled with more protesters. Early on in the march, protesters said they were encouraged by the turnout and by the support from bystanders honking their car horns or clapping while they passed. Opponents of the Charest government – including its political opposition – have begun attacking its approach to the protests, even more than the tuition hikes that originally sparked the unrest. The Montreal march came hours after the government passed a law setting limits on the ability to protest. Also Friday, a new municipal bylaw imposed stiff fines on people wearing masks while demonstrating. A few people in the crowd were in fact wearing masks. However, the mask bylaw and the protest limits were not expected to be applied until Saturday. Police said they were given the march route in advance — one ofthe many stipulations of the new provincial law. They were not commenting, however, on reports that their phone lines were flooded by people calling to report the route, in a unique gesture of civil disobedience.